There is something about a simmering stock that sets the tone for a professional kitchen. It is more than the basis for so many products and preparations; stock is the symbol of your commitment on so many levels and the signature of an operation that is serious about food. I have a methodical approach towards taking on the role of chef in a kitchen. From the standpoint of team building, I try to observe, interact, discuss, and offer suggestions to staff members before I map out an approach for the operation of a restaurant. From the standpoint of setting the tone for a serious approach towards cooking, I begin by teaching cooks how to properly make a stock, and insist that there always be a stock of some type, in production. Why is this so important? Let me explain my rationale. Cooking is a very sensual process. The experience of cooking and dining must always involve a connection with all of the human senses and since the sense of smell is likely the most acute, the sense that connects so readily with all of the others, I want it to be impactful and a signature for the kitchen. Walking into a kitchen with the deep, heady aroma of chicken or beef stock is memorable and exciting. The smell of the essence being drawn from bones and marrying with a blanched or caramelized mirepoix, reducing and blending with the natural oils drawn from herbs and spices, is intoxicating and always brings a smile to my face. Preparing stocks symbolizes to your cooks and your guests that you care about the all-important foundations of good cooking. Stocks, after all, are the backbone of quality soups, sauces, and braising liquids. There are few other flavoring components that have such a dramatic impact on the quality of finished dishes. Stocks demonstrate your commitment to cost control in an operation. They represent your desire and ability to use all ingredients in an effort to create great dishes and minimize waste. Now, there is a difference between a stock and a broth. Both are valuable in a professional kitchen for all the reasons stated above. The primary difference is that a stock formula is based on more precise measurements of specific ingredients, adherence to a systematic process of preparation, and understanding of time and temperature in relation to coaxing a consistent, balanced flavor from your stock. To prepare a soup or sauce that demands consistency, these steps and proportions need to be adhered to. A broth is simply a liquid that is built from protein and/or vegetables with the addition of water. The flavor will depend on the time involved in cooking, the temperature use, and the amount and mix of ingredients used. A broth is an excellent way to use your scraps of vegetables, seafood, and meats in an effort to build a deeply flavorful liquid that can be used in the same fashion as a stock. The primary difference is a lack of consistency. Stock use seems to be cyclical in restaurants. True, it takes time, equipment, and a bit of skill to pull off correctly, however, there are no food bases on the market that can effectively replace this hallmark of excellence in a kitchen. In the 60’s when I first began to apprentice in kitchens, it was common to find a battery of stock kettles simmering away with beef or veal, chicken, and vegetable stocks and an occasional fish fumet on stove top. After reduction, chilling and storage, professional kitchens also maintained a shelf in their walk-ins for these four primary bases for prep cooks and Sauciers. These staples were as common as bags of Spanish onions, celery and carrots. We couldn’t get by without them. In the 70’s and 80’s, the majority of kitchens seemed to gravitate to bases (some comprised of food puree and others primarily salt and artificial flavorings. Bases were easy, no skill required, they were instant, and consistent. After time, people became accustomed to the taste and attributed these convenience items as producing the flavor associated with beef, chicken, turkey, white fish, shrimp, lobster, etc. 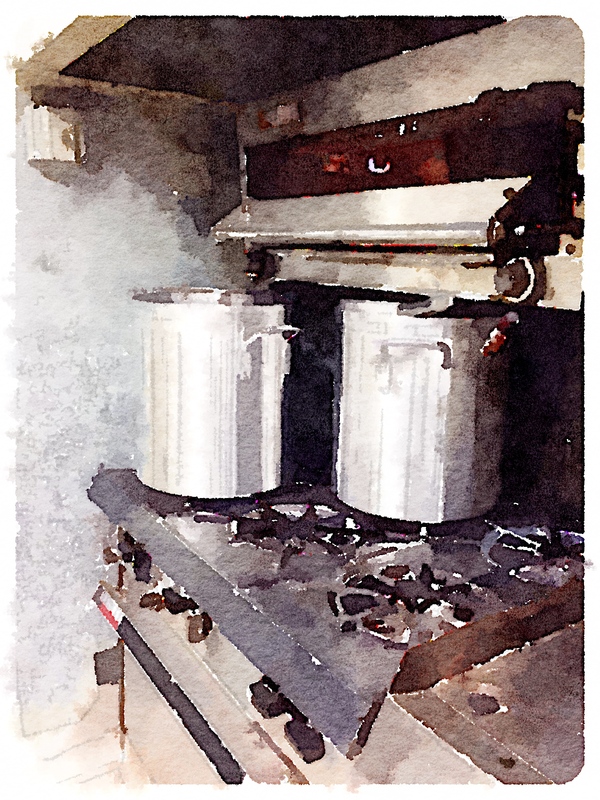 Peelings of carrots, ends and skins of onions, tops of celery, bones and scraps of meat became products for the trash can, stock kettles became catchalls for anything but broth, and very quickly, the proper preparation of sauce and soup foundations were out of the cooks repertoire. Fortunately, as the importance a great food preparation and great restaurants began emerging in the 90’s and beyond, the stockpot regained its prominence in the kitchen. Next to knife skills, stocks and broths will always be the first things that I teach in the kitchen. To me, they symbolize what it means to be a great cook. Chicken bones and necks 25 lbs. *Rinse the bones and necks with cold water.